The Arctic ice caps are shrinking at an increasing rate – part of a global pattern that may have grave consequences for the planet and all its inhabitants. Glaciologist Professor Martin Sharp and his team at the University of Alberta in Canada are attempting to understand exactly how and why this is occurring, before it is too late. A frozen landscape, ice-covered mountains, blistering snowstorms and intrepid explorers riding sleds pulled by huskies – these images often come to mind when we think of the Arctic, that ice-covered region surrounding the North Pole. Yet the Arctic is far more than this. It is a unique area unmatched by any other location on Earth – land that is largely ice-free in summer and snow-bound in winter, surrounded by an ocean that freezes over in winter. A major part of this land is known as the Canadian Arctic Archipelago – a group of islands extending north of Canada up towards the North Pole. Covering over 1.4 million square kilometres and sparsely inhabited by humans, this area is a vast stretch of frozen snow and ice for much of the year. This makes it a vital part of the Arctic environment – outside of the Polar ice-sheets, the Canadian Arctic Archipelago contains almost a third of the world’s glacier ice. Yet this ice is in danger, as steadily-increasing regional and global air temperatures lead to increased thawing and melting in the summer season. This melting depletes the mass of ice stored on land, and the resulting seasonal flood of water that it releases makes its way to the ocean and contributes to a rise in the global mean sea level. Feedbacks associated with melting and shrinking glaciers can lead to more rapid melting and further changes in the global climate, as well as changes in river runoff regimes and the release of an archive of historical pollutants stored in the glacier ice. These are the dangers that Professor Martin Sharp and his colleagues at the University of Alberta are trying to understand and hoping to deflect. A researcher in the field of climate change and glaciers, Professor Sharp is well aware that knowledge of how the ice in the Arctic Archipelago is changing is now vital for modelling what will happen in the future if the climate continues to warm. The loss of ice in Arctic regions is a significant worry for researchers. Through their research, Professor Sharp and his collaborators discovered that the Canadian Arctic Archipelago has lost over 60 gigatons (60 billion tonnes) of ice per year in recent years – an amount that is almost impossible for most of us to comprehend. For comparison, imagine that every person in the world moved to Canada, all 7.7 billion of them. This literal mass of humanity would weigh roughly half a gigaton – in other words, less than 1% of the ice mass that is being lost each year. This is quite worrying, naturally. 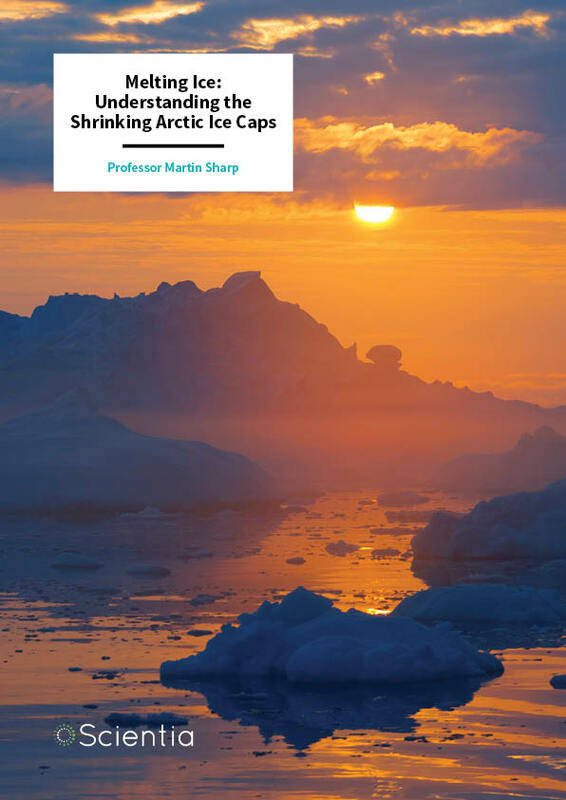 But it is also a source of confusion for many who hear about it – how can Professor Sharp and his colleagues actually know the amount of ice being lost? A gigaton is a lot of ice, roughly a cube one kilometre high, wide and long – obviously too much to just break off and weigh. The solution to this problem, and many others in Arctic research, requires a combination of old-fashioned methods and space-age technology. Measuring the mass of ice in the Arctic, for example, relies on the plethora of satellites in orbit around the Earth and the vast number of measuring devices that are attached to them. NASA’s ICESat satellite, for example, was launched purely to provide information about changes in the ice in the Polar regions, using laser ranging devices to determine the height of the ice-sheets and thus their volume and mass – and how they change over time. The GRACE mission used two satellites flying in formation to map the subtle variations in Earth’s gravity field, using the pull exerted by the ice sheets and glaciers on the satellites to calculate the amount of ice and how it changed over time. Each of these methods independently show a dramatic decrease in the mass of Canada’s Arctic glaciers, as do more traditional measurements made by scientists on the ground. Yet for all the modern technology that is available these days, Professor Sharp and his colleagues nonetheless turn to older methods when necessary. One of the classical techniques they use is known as ice core sampling – using a hollow drill to bore into glaciers and then pulling out a long core of ice stretching for many tens of metres. This ice core provides a record of the past in much the same way as the rings of a tree – every winter a new layer of snow is formed, which is then compacted over time into a visible layer in the ice. Warm summers cause the ice to melt, and the water then seeps downwards and freezes below the surface. This refrozen water has far fewer trapped bubbles than a normal layer of compacted snow. By looking along the length of the ice core (and comparing ice cores from nearby drilling locations), Professor Sharp and his colleagues can see when (and how often) warm summers have occurred in the past. The major advantage of ice core samples is that they reach back far into the past. 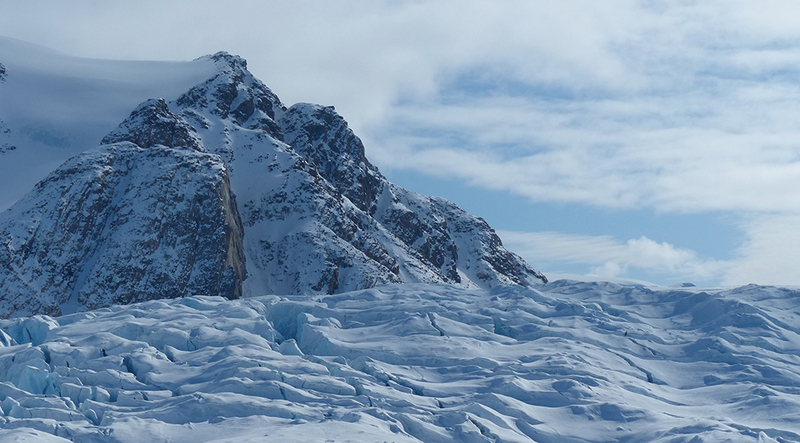 The multitude of cores collected by researchers, including Professor Sharp and his colleagues, provide a reliable record of ice-cap melting over the past 11,000 years. These data show that melting of the Arctic ice-caps has increased significantly since the mid-1990s. Indeed, the rate of melting occurring now is the highest that has been seen in the last 4,000 years. This is, obviously enough, not a good thing. Thus, Professor Sharp and his colleagues decided to move onto more detailed methods to study this melting in further detail. 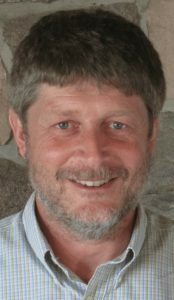 Numerous studies by Professor Sharp and his colleagues have shown that the amount of ice present in the Canadian Arctic Archipelago has decreased significantly in recent years. This drop is enough that the melting of glacier ice in this region is now the largest contributor to rising sea levels after the Polar ice-sheets in Antarctica and Greenland. Yet the melting process is more complex than we would think. The climate of the Canadian Arctic Archipelago is fairly constant during the winter (with consistent levels of snow falling every year) but quite variable in the summer, when daytime temperatures bring temperatures above the melting point of ice. Previous research has shown that the periods with maximum glacier melting are usually associated with higher air pressure over the Canadian Arctic Archipelago. These high-pressure systems, known as anticyclones, usually have clear, cloudless skies in the centre surrounded by a large-scale clockwise circulation of air. In the Canadian Arctic Archipelago, these anticyclones tend to move warm air from the south into the colder north, leading to higher air temperatures over the ice caps. The clear skies also allow more solar radiation to reach the ground, warming things further. This in turn leads to increased melting. To examine this phenomenon, Professor Sharp and his colleagues examined historical records of the occurrence of summer high-pressure systems in the region using a dataset covering over six decades from 1948 to 2012. The team correlated these records with records of other factors such as ice melting. 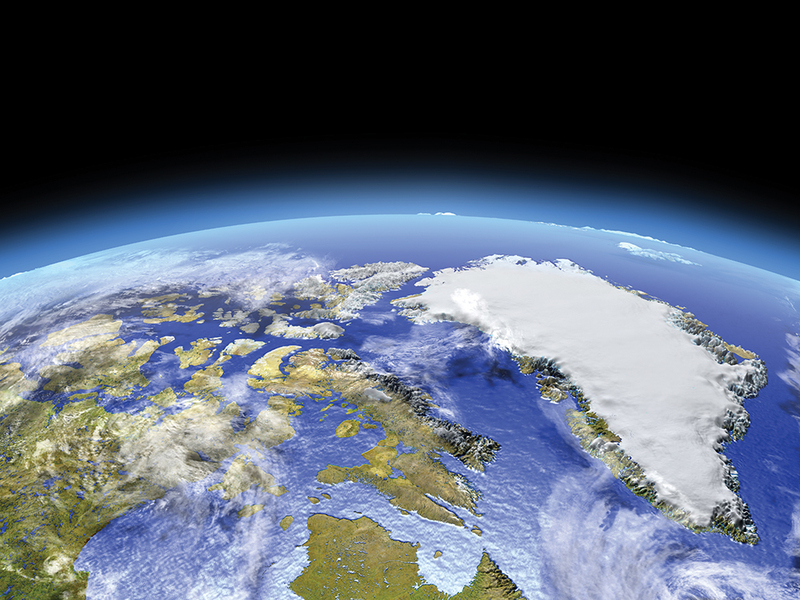 The researchers were able to show that the presence of these anticyclones was directly related to the changes in Arctic ice-cap thickness and the intensity of surface melting during the summer months. How much of an effect did this process have? The answer to this came from orbit. Professor Sharp and his colleagues used data from two satellites owned by NASA, known as Terra and Aqua, which provide full visualisation of the Earth’s surface every 1–2 days. This provides a near-constant dataset that can be used to track surface temperatures over a long period of time. 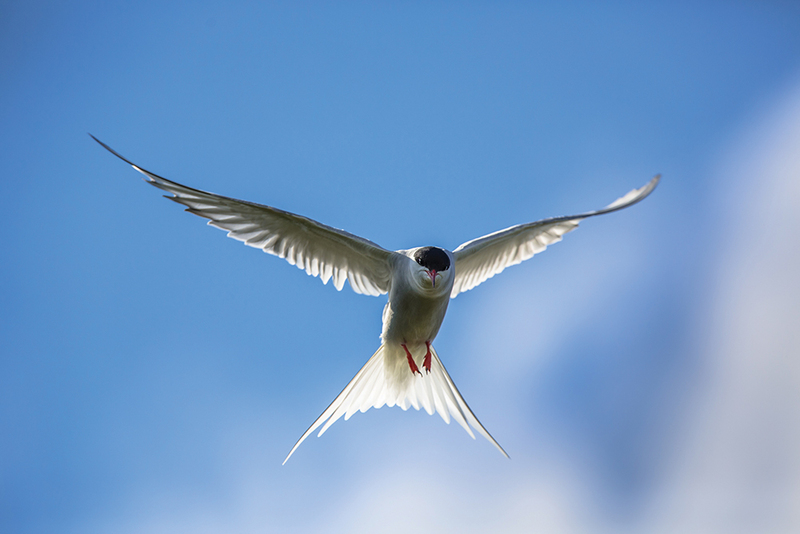 In the case of their latest study, the researchers focused on the Queen Elizabeth Islands in the Canadian Arctic Archipelago over a period stretching from 2000 to 2015. They were able to show that the surface temperature of glaciers on the island increased by approximately 0.06°C every year. This seems like a small amount, but one that adds up – over the period they studied, temperatures increased by almost an entire degree. Much of this increase was concentrated in the seven years from 2005 to 2012, which had particularly warm summers and was the warmest period since reliable meteorological data were first collected in the region. Similar to the previous studies, the team was able to show that these warm summers are correlated with the presence of high-pressure regions in the area. But it’s only one degree, you might say, surely this is not that important? Professor Sharp and his colleagues recently carried out a study of the largest lake in the Arctic. Increasing temperatures by only one degree led to a ten-fold increase in the amount of meltwater runoff from the surrounding glaciers. The increasing flows of water and fine sediment into the lake led to thawing of the lake’s icy surface in summer, and a complete change in the ecology of the lake. A change in temperature of only a single degree, they note, led to conditions that have not been seen for centuries. The current set of data is not looking good for the future of the Arctic glaciers, or indeed the planet. Record levels of melting are regularly seen, and glaciers and ice-sheets are thinning and shrinking. Professor Sharp and his colleagues are responsible for increasing our knowledge of the area, making our forecasts of changes to come ever-more reliable and accurate. Yet all the information in the world does nothing if it is not acted upon. That part, by contrast, is up to us. 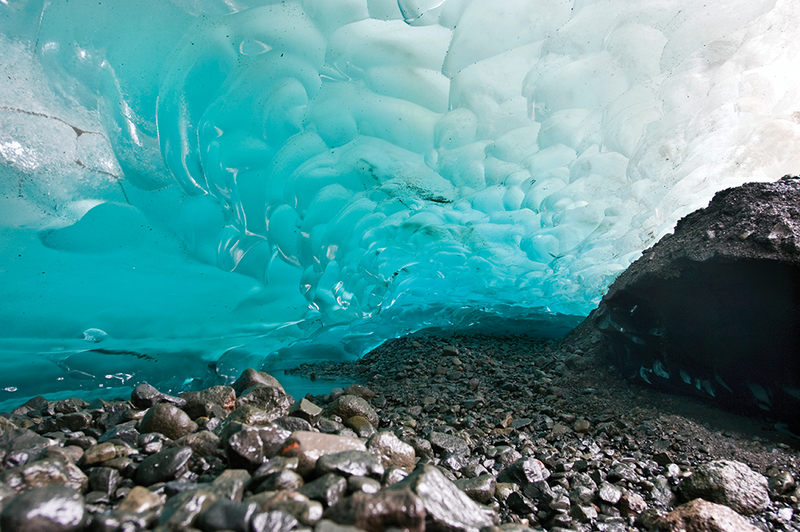 Professor Sharp began his long research career with a PhD focusing on the glaciers of Iceland. He followed this initial interest with a decade-long stint in the famed halls of the University of Cambridge, taking roles of successively greater responsibility. In 1993 he jumped across the Atlantic to the University of Alberta, Canada, where he rose to his current role as Professor in the Department of Earth and Atmospheric Sciences. His long and successful career has led to over 200 publications, each providing yet more knowledge in his chosen field of the Arctic and its environment. I Lehnherr, VL St. Louis, M Sharp, AS Gardner, JP Smol, SL Schiff, DCG Muir, CA Mortimer, NM, C Tarnocai, KA St. Pierre, CA Emmerton, JA Wiklund, G Köck, SF Lamoureux and CH Talbot, The world’s largest High Arctic lake responds rapidly to climate warming, Nature Communications, 2018, 9, 1290. A Rutishauser, DD Blankenship, M Sharp, ML Skidmore, JS Greenbaum, C Grima, DM Schroeder, JA Dowdeswell, and DA Young, A hypersaline lake complex beneath Devon Ice Cap, Canadian Arctic, Science Advances, 2018, 4. eaar4353, 7. C Mortimer, M Sharp, and W van Wychen, Influence of recent warming and ice dynamics on glacier surface elevations in the Canadian High Arctic, 1995–2014, Journal of Glaciology, 2018, 64, 450–464. C Mortimer, M Sharp, B Wouters, Glacier surface temperatures in the Canadian High Arctic, 2000–15, Journal of Glaciology, 2016, 62, 963–975. P Bezeau, M Sharp and G Gascon, Variability in summer anticyclonic circulation over the Canadian Arctic Archipelago and west Greenland in the late 20th/early 21st centuries and its effect on glacier mass balance, International Journal of Climatology, 2015, 35, 540–557. D Fisher, J Zheng, D Burgess, C Zdanowicz, C Kinnard, M Sharp, J Bourgeois, Recent melt rates of Canadian arctic ice caps are the highest in four millennia, Global and Planetary Change, 2012, 84–85, 3-7. AS Gardner, G Moholdt, B Wouters, GJ Wolken, DO Burgess, M Sharp, JG Cogley, C Braun & C Labine, Sharply increased mass loss from glaciers and ice caps in the Canadian Arctic Archipelago, Nature, 2011, 473, 357–360.